2019 Seed, Fertilizer and Chemical Costs: What do we know now? Here I am discussing 2019 and in my area, we haven’t yet cut 2018 wheat. Am I thinking too far ahead? I don’t think so when looking at 2018 and 2019 corn prices. As of this writing, Dec 19 corn is trading at $3.96 with Dec 18 corn 23 cents lower. Those aren’t prices I like, but those are the prices I currently have to live with. On the other side of profit is cost. If my variable costs decline in 2019, maybe $4 corn can make me money. If variable costs don’t decline in 2019, I would rather know that now than one year from now. 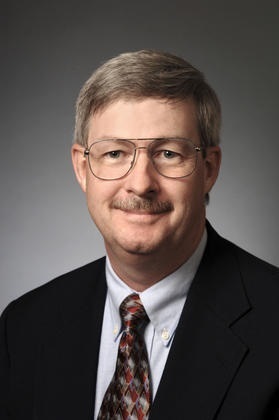 Gary Schnitkey, University of Illinois Agricultural Economist, recently reviewed seed, fertilizer and chemical cost trends, both long run and short run. The trends do not portend declines in variable costs for farmers. Seed cost appears to have flattened and are likely to be the same as 2017 and 2018. 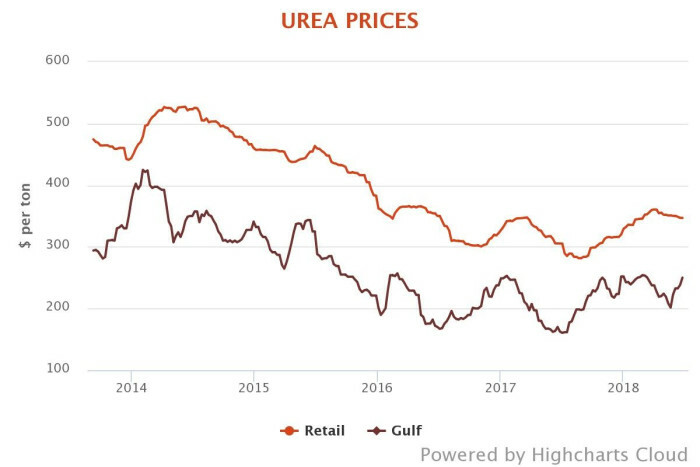 Fertilizer prices rose beginning in late 2017, leading to farmers who bought 2018 fertilizer late with higher costs than those who bought early. So a reasonable fertilizer forecast is that 2019 fertilizer costs might be slightly higher than 2017 and about the same as 2018. Chemical costs, however, are likely to be higher, not due to price but due to usage. Increasingly resistant weeds are showing up in farmer’s fields, and thus more product or new products are used to control weeds. From its peak in 2013, seed, fertilizer and chemical costs declined from $373 to $323 in 2017. That decline was due entirely to lower fertilizer prices. Anhydrous ammonia declined $370/ton. Diammonium phosphate dropped $186 from 2013 to 2017 although during 2018 it has risen by nearly $50/ton. Other fertilizer prices have also risen since mid-2017. 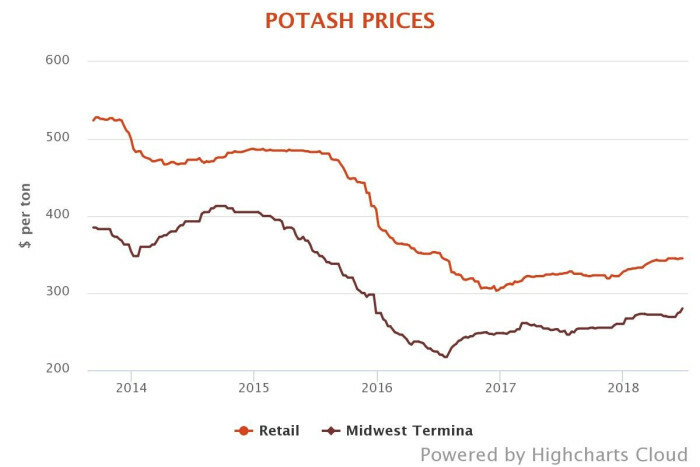 All nitrogen prices have increased while potash has remained flat. That brings us to planning for 2019 crops. Using current trends, it seems reasonable for farmers to plan for slightly higher pesticide, seed and fertilizer costs for 2019. This means crop marketing will be a significant management activity for grain produced in 2019. A question all farmers might ask is whether to start marketing 2019 corn or soybeans now. And with current oil price trends, farmers should probably consider pre-paying for fertilizer as well. The past two years, fertilizer prices have been lower in the fall preceding planting. Fertilizer Outlook – Fertilizer costs rise despite weak crop prices, Accessed 27 June 2018, http://www.farmfutures.com/story-weekly-fertilizer-review-0-30765. 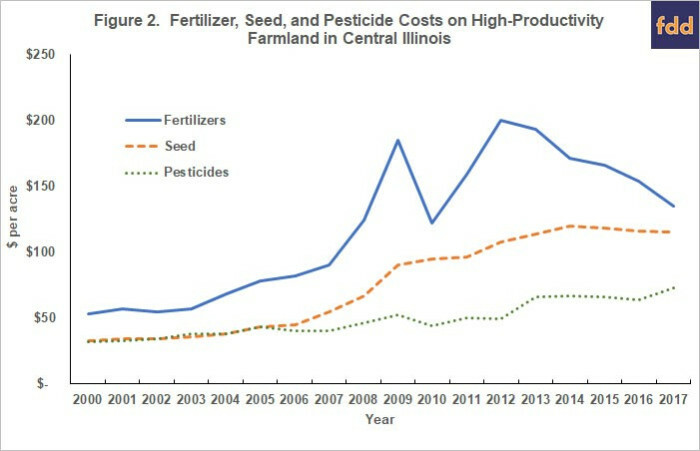 Schnitkey, G. “Historic Fertilizer, Seed, and Chemical Costs with 2019 Projections.” farmdoc daily (8):102, Department of Agricultural and Consumer Economics, University of Illinois at Urbana-Champaign, June 5, 2018.